Spain has done it again. I doubted, I waivered, I even hoped for an opposite outcome so I could break my attraction. But yet again, another really great wine experience out of the next door neighbor to France, of which has produced some of the best wines of all time. The bodegas (wineries) of Spain are continuing a steady march into positioning themselves as some of the best in the business, both cellar-worthy and everyday drinkers fit for any gathering or meal. Wine and food culture go hand-in-hand. To enjoy both Spanish wine and culture, I cooked up a batch of traditional paella. When making paella give yourself plenty of time and plenty of wine – it’s a labor of love, but well worth it. Paella is Spain through-and-through – chicken, sausage, and seafood blend together with the rice to create a well-balanced symphony of flavor. If prepared traditionally, meaning cooked outside over a fire pit (I did mine in a Big Green Egg), the smoky notes of the wood charcoal are what give the paella that unbeatable slap-in-the-face flavor that cannot be recreated on the stove and were a spot-on pairing with the wine. 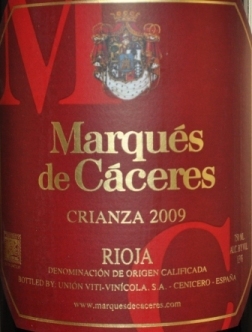 The wine is a full-bodied dark, ruby red typically of Tempranillo based wines. The nose is ripe dark fruits with a slight hint of tobacco and leather. The mouth-feel is very well rounded, coating every part of the palate. On the palate the dark fruits abound, along with slight spice, smoke, and noticeable yet not overbearing tannins. This wine is a “Crianza”, meaning that it was aged in oak barrels for a year. The oak aging lends to the smoky, toasted notes which again created a beautiful pairing with the food. The finish is long and not easily forgotten. My parting thoughts – take time to enjoy a home-cooked meal that takes more than 15 minutes to make. Uncork a great bottle of wine, make something that will be memorable, and enjoy with family and friends. That is what life is all about! Salud!